The sun's closest stellar neighbors are three stars in the Alpha Centauri system. The two main stars are Alpha Centauri A and Alpha Centauri B, which form a binary pair. They are an average of 4.3 light-years from Earth. 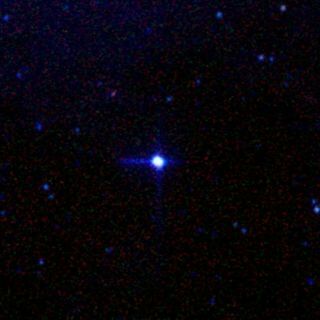 The third star is Proxima Centauri. It is about 4.22 light-years from Earth and is the closest star other than the sun. Alpha Centauri A and B orbit a common center of gravity every 80 years. The average distance between them is about 23 astronomical units (AU) — a little more than the distance between the sun and Uranus. Proxima Centauri is about one-fifth of a light-year or 13,000 AUs from the two other stars, a distance that makes some astronomers question whether it should be considered part of the same system. Proxima Centauri may be passing through the system and will leave the vicinity in several million years, or it may be gravitationally bound to the binary pair. If it's bound, it has an orbital period around the other two of about 500,000 years. Astronomers announced in August 2016 that they had detected an Earth-size planet orbiting Proxima Centauri. The newfound world, known as Proxima b, is about 1.3 times more massive than Earth, which suggests that the exoplanet is a rocky world, researchers said. The planet is also in the star's habitable zone, that just-right range of distances where liquid water can exist. Proxima b lies just 4.7 million miles (7.5 million kilometers) from its host star and completes one orbit every 11.2 Earth-days. As a result, it's likely that the exoplanet is tidally locked, meaning it always shows the same face to its host star, just as the moon shows only one face (the near side) to Earth. However, it's unclear just how habitable Proxima b is from today's telescopes. This means that astronomers need to run models and do comparative studies to better understand how habitable the planet might be. As a start, the planet needs a closer look for investigators to look for signs of an atmosphere. From there, the investigators can extrapolate if that atmosphere (if present) allows liquid water to flow on the surface. Even the surface temperature of the planet depends on the atmosphere, which would also play into habitability characteristics. Because Proxima b is so close to a red dwarf, habitability problems are already coming to scientists' minds. For one thing, the planet is so close that it likely is tidally locked to the star, meaning that one side of the planet is always facing the star. This means one side of the planet would be very warm, while the opposite side would be very cold – unless winds could distribute the heat around the planet. That makes it hard for life to exist. But the planet's close distance to the red dwarf presents other problems too. Red dwarfs are unstable stars, particularly when they are young – they have a lot of stellar activity and produce charged particles, which can produce intense radiation on nearby planets. Some of this radiation can strip molecules off the top of a planet's atmosphere and thin it over time, according to 2017 studies led by the NASA Goddard Space Flight Center in Greenbelt, Maryland. The system is in the Southern sky and is not visible to observers above the latitude of 29 degrees north — a line that passes near Houston, Texas, and Orlando, Fla. In the Southern Hemisphere, it's easy to find because the cross-piece of the Southern Cross (from Delta to Beta Crucis) points the way. Its right ascension is 14h 39m 41s and its declination is minus 60 degrees 50 minutes 7 seconds. Correction: This article was updated on March 20, 2019 to include the correct distance between Alpha Centauri A and B.